The “Blog” of “Unnecessary” Quotation Marks: "extensively"
My friends Matt and Marianne spotted this one at a Bloc Party show in Chicago. 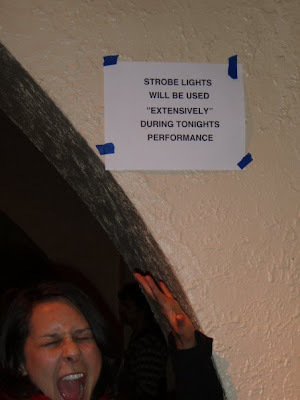 He claims that they did use the strobe lights quite a bit, which leads me to believe that when they asked the tech how much they used strobe lights, s/he answered "extensively." So, only for a few annoying seconds? OK, so I just found this blog and I scrolled through it... this is hysterical. I'll have to keep an eye out for "unnecessary" quotation marks to send in to you. Awesome blog. And, strobe lights are just about the only thing that could make me think twice about going to see Bloc Party. You could argue this is legitimate as the sign writer could be quoting the band's production crew. But I guess that doesn't mean it's not unnecessary all the same.